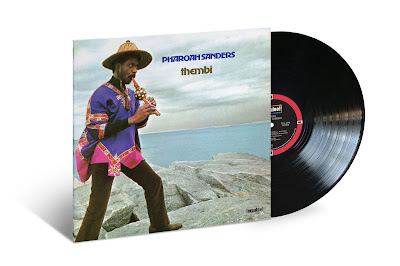 Jazz legend Pharoah Sanders' one-of-a-kind, mosaical free jazz classic "Thembi" – not pressed on vinyl since 1987 – is available once again via Impulse!/UMe. Originally released in 1971, the Ed Michel and Bill Szymczyk-produced album is pressed on black vinyl and housed in a high-quality wrapped jacket. Thembi, named after Sanders' son and compiled from two sets of sessions, captures the tenor saxophonist at his hyper-eclectic peak. And that MO was captured literally as the musicians unloaded their instruments to record the music. As organist Lonnie Liston Smith related in 2007, "We got to the studio in California — Cecil McBee had to unpack his bass, the drummer had to set up his drums, Pharoah had to unpack all of his horns. Everybody had something to do, but the piano was just sitting there waiting." That was the first time Smith touched an electric keyboard — and Sanders followed suit. Not only did the tenor player pick up alto and soprano horns, but other oddities like cow horns, fifes and a small African thumb piano called the bailophone. Not only this, co-producers Michel and Szymczyk revolutionarily made something more indebted to Sgt. Pepper than "So What?" Their mixes teem with psychedelic, trippy effects — echo, reverb and phasing. It all reflected Sanders' legendarily "outer limits" state of mind. While its experimental sound naturally divided critics and fans, time has been good to this unusual LP. In a retrospective review in 2011, All About Jazz called it "unalloyed bliss from start to finish, a sweet and lyrical evocation of Eastern mysticism." Revive Music noted its "use of dozens of instruments, including the sounds of birds and the yelping voices of humans," concluding "Thembi is a testament to the fact that timeless classics are never attributed singularly to technique, but are instead conceived of strong directional intent, a will, and love." "Thembi" is both East and West Coast jazz — Side A and Side B were recorded by two different ensembles in LA and New York, yet it isn't a disjointed compilatory album. Instead, the love and light of "Thembi" creates a complete feeling, from the percolating "Astral Travelling" to the clattering "Bailophone Dance." For jazz fans looking for a little more of a rough ride than polite dinner music, "Thembi" is a must-have in your record collection.